The cacophony of notifications, blips, chirps, and pings that make up modern life has become one of my favorite areas of interest in the art community. As our jobs, relationships, family, and friends increasingly demand more responsiveness and constant availability, our collective anxiety will only continue to grow. When emphasized, this weight on our mental well-being can fatigue; inversely, when contextualized, it can serve as one of the most exciting subjects for contemporary art to explore. The work of Katherine Mitchell DiRico has always been concerned with not only this tension but with how those digital networks collide and intersect with one another. In no better way are these intersections rendered than in Instruments of Synesthesia, Katherine Mitchell DiRico’s new exhibition at the Abigail Ogilvy Gallery. Located at 460 Harrison Avenue, the subterranean gallery is a beacon of the South End art scene, known for paradigm-pushing curation and their considered but eclectic range of works on display. It is with this growing digital fatigue that I descended into the world of Instruments of Synesthesia. The space felt dense. The pieces seemed to have enough space to breathe while also being able to reference (almost gesturing to) each other. My favorite piece was in the center and anchored the show, a hub as it were. 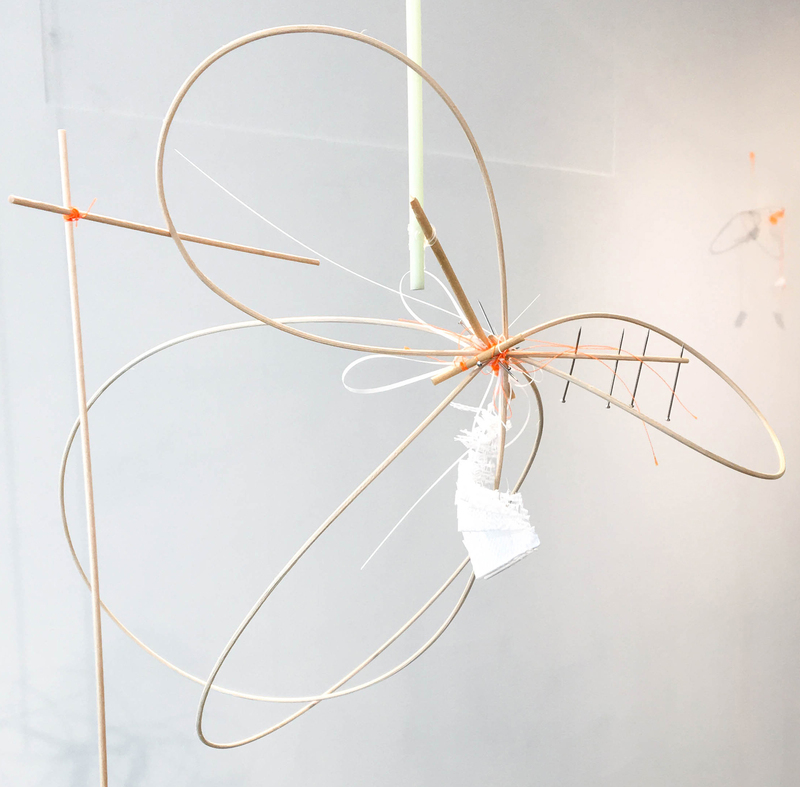 Weighing our Contingency Plan was a feat of sculpture and installation that combined wood, rattan, monofilament, thread, vibration, mirrors, pins, aluminum weights, chalk, and bioplastic. This created a composition that is aesthetically engaging but feels decidedly out of synch. 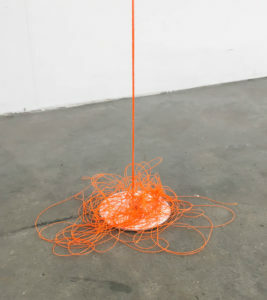 The long elements of the piece splay outward, the joints are asymmetrical and barely connect in areas, and the introduction of neon orange powder is one of many naturalistic touches that are completely subverted with the introduction of a striking palette or an unconventional material. This piece speaks to the larger network around us, both in the gallery and in cyberspace—the networks that connect us to one another, and the networks that are barely connected, out of synch, and always tracking keeping an eye, and sucking up our data. As a viewer, I invite you to circle it, gaze into the warped mirror on the ground, watch the gentle pieces of monofilament and plastic move gently from the wind, and allow it to envelop you. 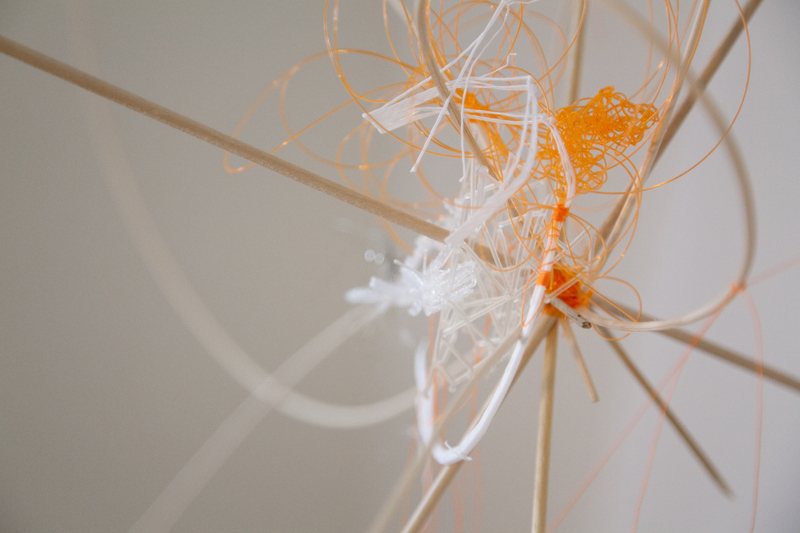 Using monofilament, the artist is able to highlight the myriad of networks that connect us, but also the tension that those intersections can create, in ourselves but also in the systems that exist in our greater cyberspace. This manifests in a massive network that spans the gallery, playing with the duality of a network connection, but out synch. Each work makes great use of the space holistically, considering both the ceiling and the floor as a continued canvas. Leading the eye from the attachment point all the way down to the floor, the disparate are part of the same massive web, an out of synch network, yearning for convergence. What if we just tore down these networks? Went back to the first Social Network: your neighborhood or community? As our collective networks grow and multiply, we feel lonelier and more isolated. Perhaps this is the exhibit you need to inspire you to try to connect your own networks. As you ponder the myriad networks that synch in and out of your life and are enveloped by the flood of buzzes and notifications, I implore you to allow yourself to be enveloped by the work of Katherine Mitchell DiRico. Instruments of Synesthesia: Katherine Mitchell DiRico will be on view through April 28th. More information on the exhibition and Abigail Ogilvy Gallery can be found on their website.